The 12th century romanesque nave and chancel church was built on the site of a 7th century monastery founded by St Fiachre. The church was built on sloping land and a crypt is situated at the eastern end of the church. 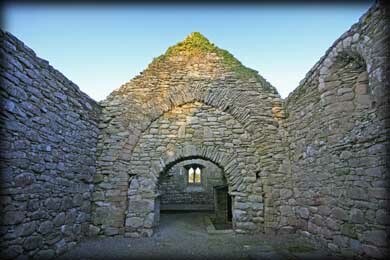 The inside of the church was greatly altered during the 16th century. 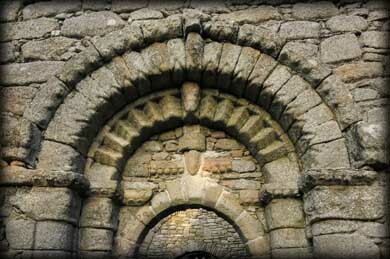 The most notable feature is the much weathered western doorway. 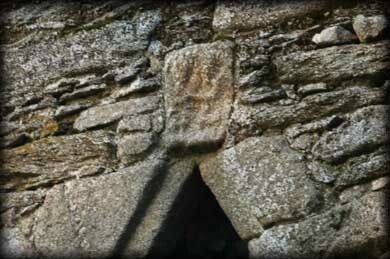 The doorway was built in typical romanesque style, there are two very worn masks, one of which is on the keystone. There are three orders, but the inside order has been completely rebuilt. 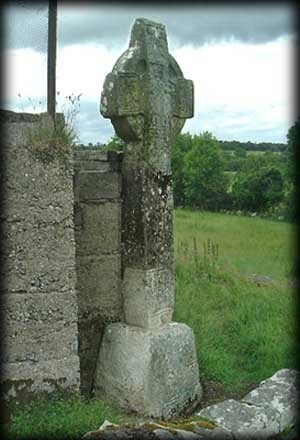 Standing about 4 metres tall at the rear of the church is a badly weathered High Cross. This granite cross consists of three fragments joined together. The remaining sections of the shaft are joined together by a modern piece of concrete. The East face, pictured right, is so badly weathered that you need good light conditions to view the iconography. At the bottom of the shaft are six of the apostles, presumably the other apostles were carved on the missing section. The top of the shaft has a panel with Adam and Eve representing the fall of man. The imperforate head of this face has a crucifixion scene carved at the centre. This cross is part of the Barrow Valley group of crosses and the similarities can be clearly seen in the carving and design of the panels around the centre of the head. To the left is David playing his Harp, and to the right is the sacrifice of Isaac, The panel at the top of the head is open to interpretation, there have been a number of suggestions, Cain slaying Abel, Massacre of the innocents and St Paul and Anthony are a few. The East side of the base has interlace and spirals carved in a number of panels, two of the panels were the width of the base with three smaller panels below them. The west side of the cross is so badly worn it is impossible to decipher the carvings. 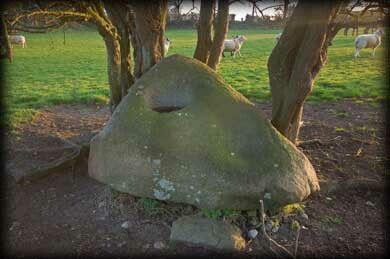 In the field to the North of the Church are two bullaun stones nestled beneath a few trees. 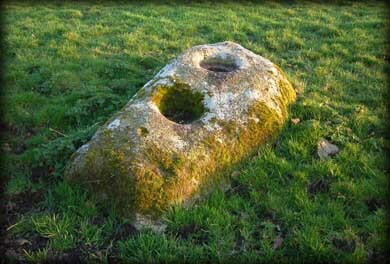 One is a large boulder with a single bullaun, pictured left and the other is a rectangular stone with two large bullauns, pictured below. Further to the north is a holy well which we did not visit due to the large amount of lambs present in the field, hopefully on our next trip we will be able to visit this well. Late afternoon/Early evening is probably the best time to visit Ullard to get good images of the cross. We arrived just a little to late on this trip as the sun was shining on the western face. Situated: From Graiguenamanagh take the R705 north for about 5 kilometres, then take a right turn sign-posted Ullard Church. The Church is 1 kilometre down this road on your left. Discovery OS. Map: S 723 481. Last Visit: March 2011.